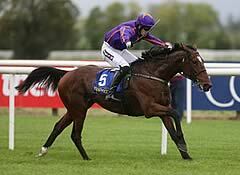 Wicklow Brave and Frankie Dettori caused a major upset in the Palmerstown House Estate Irish St. Leger at the Curragh. Having won his last six starts including a brilliant display in the Gold Cup at Royal Ascot, last year's winner Order Of St George was unsurprisingly extremely cramped odds to successfully defend his crown as the 1/7 favourite. Ryan Moore was happy to bide his time, settling Aidan O'Brien's stayer at the rear of the four-runner field, while Dettori attempted to dominate from the front aboard the Wicklow Brave. It was clear from early in the straight it was not going to be plain sailing for the market leader, with Moore having to get lower in the saddle in an attempt to coax his mount closer to the lead. He began to make inroads inside the final two furlongs, but 11/1 shot Wicklow Brave kept up the gallop and had just enough left in the tank to hold Order Of St George at bay by half a length. It was a first Classic success for Ireland's all-conquering champion National Hunt trainer Willie Mullins. The front two pulled a long way clear, with Ed Dunlop's 2014 Gold Cup winner Trip To Paris just beating big outsider Silwana to third. A jubilant Dettori said: "I didn't expect that, honestly! "He was very brave and Willie gave me free rein and said if you want to go to the front and do your stuff, work away - I was quite surprised that I didn't hear anybody coming until about a furlong to go and we ground it out in the end. "It was a surprise, but a Classic win is always great. Willie is a top man, his horses are always in good nick and we tried something different and it worked out. It was always the plan, to set the fractions, in a small field like that." He added: "I told Willie there's no chance of me riding him over hurdles, no chance! "He's was only about Willie's fourth choice for this too, imagine what Annie Power would do in this race?"